I'm going to do what to that lovely chair and table set? Well, I intend to expose it to the direct heat and ultraviolet rays of the sun. Then I'll let it get soaking wet, freeze, and then thaw out with blasts of warm, dry air. And I'm going to allow this to happen not just once, but over and over again for the next two to three decades. Well, of course I am: I'm building a piece of outdoor furniture. The question is, how can I possibly build wood furniture to endure such horrific abuse? To find some answers, I looked back to the principles and practices of the carriage and boat builders of the last century. It was, after all, these tradesmen who produced some of the most highly stressed and severely exposed—not to mention beautiful—structures known to man. If these trades could do that, I was betting they could build one heck of a lawn chair. What I learned boiled down to this: These craftsmen asked much of every piece of wood that went into a ship or carriage, but they never asked more that it could give—and they did all they could to preserve its integrity. They chose woods that were inherently rot-resistant, being careful not to include sapwood, splits, pitch pockets, cross-grain, or other defects that might diminish its strength or longevity. They cut the exposed shoulders of joints at water-shedding angles and applied bedding compounds like pine tar and Irish felt to the mating surfaces—strategies that helped prevent moisture from intruding, lingering, and nourishing wood-eating parasites. They designed channels, drain holes, and dams throughout the structure to encourage water to flow away from the wood. They avoided flat surfaces, bowing the tops of horizontal areas like rails and box lids to discourage puddling. And where fasteners were needed (though they minimized their use as much as possible by using wood wedges and pins), they chose metals that resisted rust and were not corrosive to the wood. While I don't intend to build America while sitting in my lawn furniture (I don't even intend to be awake), I do want the fruits of my labors to serve my family for many years. To that end I employ much of what I have learned from these long-gone tradesmen. And, so far, that chair and table have remained lovely, continuing to do the job for which they were intended—while living happily outdoors. A builder of outdoor furniture and boats, Jim Tolpin is also author of several books for the Taunton Press, including Building Traditional Kitchen Cabinets. He lives in Port Townsend, Washington. He is shown here inside a tinker's wagon that he built 15 years ago from douglas-fir and tongue-and-groove pine. 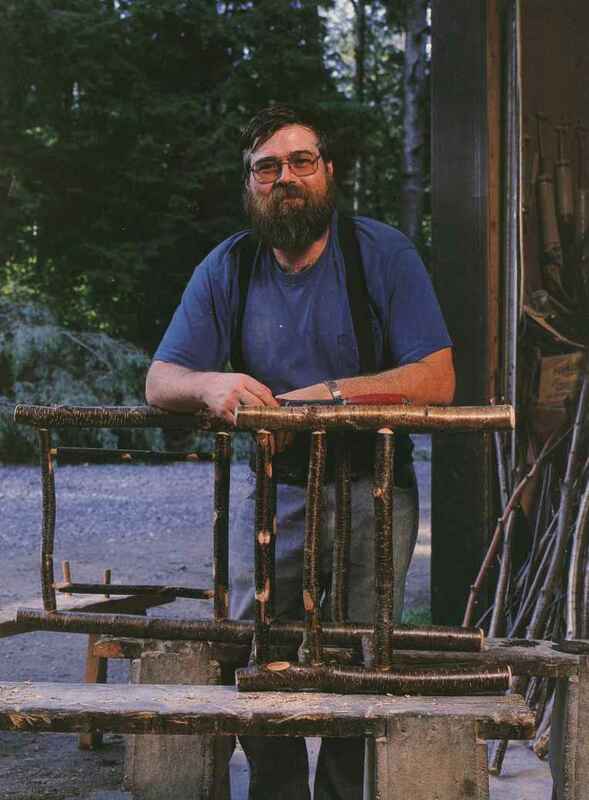 Thomas Phillips is a woods manager in Tupper Lake, New York, where he has been restoring outdoor and rustic furniture for nearly 20 years. I was actively involved with repairing all manner of camp furnishings when an antique dealer friend convinced me to make my first chair. After taking the plunge, I spent three years researching before I attempted my first piece. That was 11 years ago, and I still have it: a split post-and-rung model. Now I build mostly "twig" furniture, the kind with the bark still on. The various indigenous woods I work with provide me with color, form, and texture, allowing an artistic freedom of expression virtually unlimited by straight lines. Originally this work evolved to complement my lifestyle, and it has since become a very rewarding sideline, providing a business and personal recognition far beyond anything I ever dreamed of. Working with wood in its natural state is particularly challenging. Much preparation and thought goes into every piece I build. 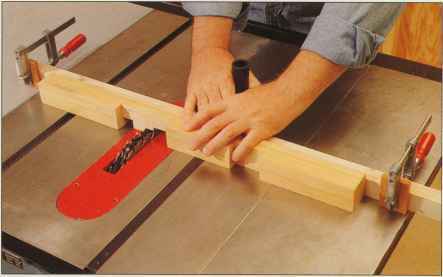 A thorough knowledge of the wood I intend to work with is a must. As an example, if I want to have natural bark on a project, then I am restricted to harvesting my materials during a few months in the cold season. Also, tools to work wood in its natural state are not readily available. More often than not, figuring out how to do something takes longer than actually doing it. One of my biggest problems is storage: A stash of natural stock for chairs takes up far more space than milled limber. There is always some detail that challenges my abilities and ingenuity to execute it, whether I am working with one of my own designs or something I've received from some architectural firm. Often when I am in the forest during my daily activities I find my eye captured by a special curve some sapling has grown into and a piece of furniture will take form, piece by piece, in my mind. I can often see the finished product before I even harvest the unique form that caught my eye. Then, it may be three weeks, sometimes as much as five years, before the materials are dry enough to work with. I may consider subsequent designs, but I often go back to the original one I saw. The actual hands-on work required to make the piece may take a few hours or weeks, but when it's finished, it always leaves me with a sense of fulfillment and accomplishment, temporarily drained of the artist's creative spark and overwhelmed by the natural beauty of wood itself and the warmth it provides.